This story is being featured as part of our “Yahoo Best of 2015” series. It was originally published on February 26, 2015. 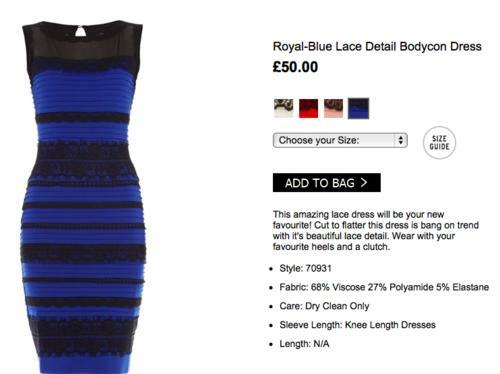 It was the mind-bender that blew up the Internet: the mystery of the dress colors. Within hours, the image went viral. It’s been driving people crazy. What colors are the dress? Is it blue with black lace, or white with gold lace? You see one or the other, and you probably can’t believe anyone else would see anything different. Each person is certain that his or her perception is correct. Theory 1: It’s a hoax. I see blue with black. Anyone who claims to see white with gold has got to be trolling me. Right? Wrong. Because it’s easy to find somebody you know, somebody you trust, somebody in your own family, who sees the photo with the “wrong” colors. For example, two of our own Yahoo Tech writers — straight shooters, truly good people who would gain nothing by humiliating me in public — swore to me that they saw the dress as white and gold. Theory 2: We’re using different kinds of screens. Do phones and laptop screens show two different things? Do different kinds of LCD panels show different colors? No. Because in many, many cases, two people sitting side by side, looking at the same screen, have seen different colors. Furthermore, many people have seen a different pair of colors when they’ve looked at the same photo on the same device later. Some say they can force their brains to go back and forth! Theory 3: It’s science that you don’t understand. Wrong. Because if people identify colors so wildly differently, we’d have arguments about color names all the time. 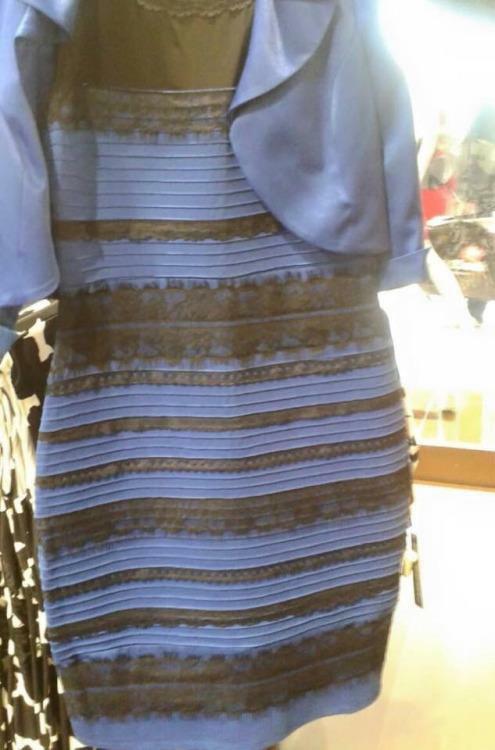 It wouldn’t take some stupid photo of a dress in 2015 to reveal this phenomenon. Theory 4: Half of you are just nuts. People soon started using Photoshop’s eyedropper tool to identify the colors of the photo for sure. 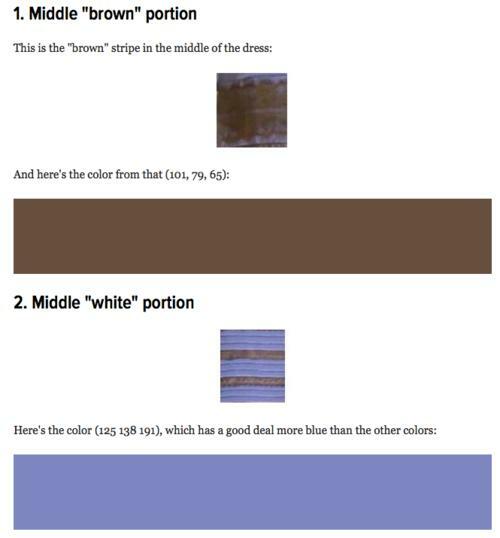 This site, for example, “proves” that the colors are blue and brown by using Photoshop to sample the stripes. That’s it, then! Mystery solved! Right? Wrong. Because we’re not talking about the JPEG image, and we’re not talking about the original dress; we’re talking about the photograph of the dress. And that means that factors like white balance are at play. “The backlighting throws off the sensor” of the camera, explains one commenter. Theory 5: Your brain might be compensating for shadow. Over at the official Flickr blog, resident data scientist Bhautik Joshi gives a similar take, explaining how the human eye adjusts to what it’s seeing according to either indoor or outdoor lighting. 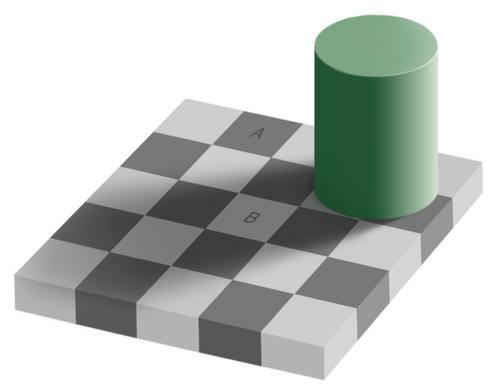 This means two different people looking at the same picture of the same dress may experience opposite on-the-fly vision correction and perceive different color arrangements. Now we’re getting closer; read on. He’s right on that last part. I’m red-green colorblind. I see black in those areas. And I cannot see white/gold in the dress image no matter how hard I try. If McLeod’s theory is true, you’d expect that many more people would see white/gold than blue/black — and, in fact, that’s what the numbers show. In a BuzzFeed poll of more than 1.2 million people so far, 73 percent said they saw white/gold. But wait: 27 percent of the poll respondents saw blue/black in the dress. 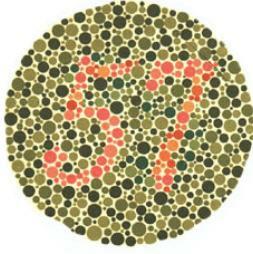 However, only 7 to 10 percent of the male population has red-green colorblindness. So what about the rest of the blue/black-seers? 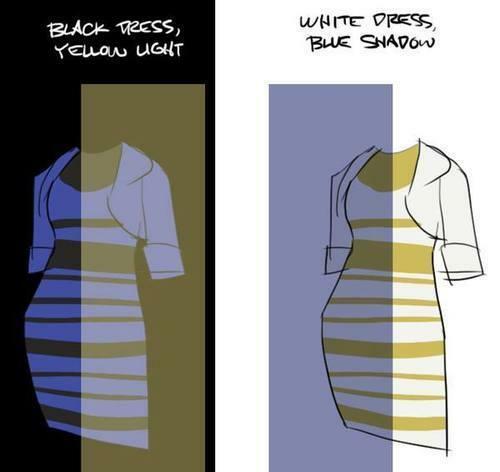 And what about people whose perception switches back and forth between white/gold and blue/black? “I’m guessing that across the population, the phenomenon is a combination of red-green deficiency and context,” McLeod says. In other words, there’s a second factor at work: the context of the lighting and time of day. All the experts agree that this is one of the most intriguing color-perception puzzles to come along in quite a while. It works only because of these particular colors in this particular photograph: a freak of photography, light, and color. The experts also agree that it’s not an especially beautiful dress.